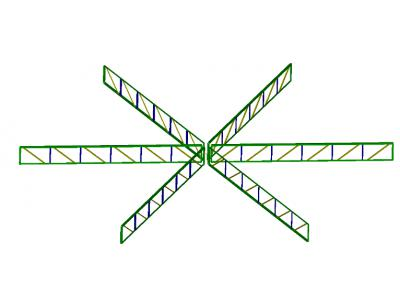 Work was done on assessing the strength, stiffness and stability of the structures of the “Merry Pinwheels” attraction designed for entertaining children over three years old and adults. Design calculations are made in accordance with the requirements of GOST R 52170-2003 “Safety of mechanized rides. 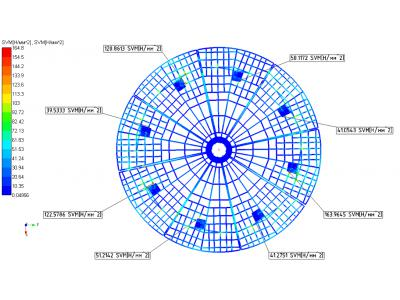 The main provisions for the design of steel structures. Updated edition. 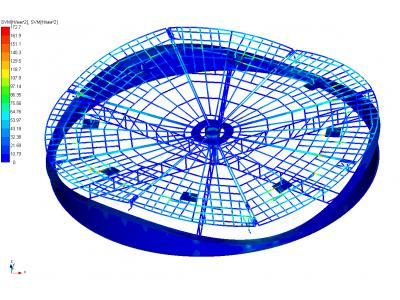 The calculations were performed using the APM Structure 3D module, which is part of APM Civil Engineering. Figure 1.1 - Attraction "Funny turntables"
The attraction platform consists of segments that move in waves around the central vertical axis of the attraction. The attraction cabs rotate around their axis. Attraction designed besfundamentnym. 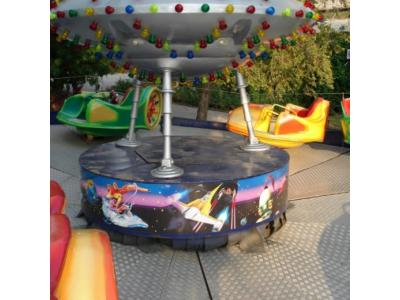 In accordance with the requirements of GOST R 52170-2003 “Safety of mechanized rides. 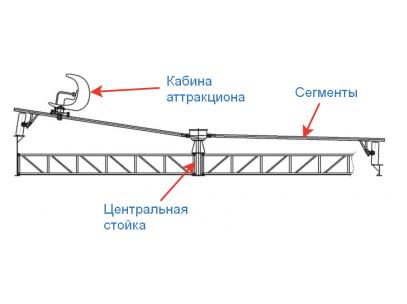 The main provisions for the design of steel structures. Updated editions of strength, stiffness and stability calculations are performed for the most unfavorable combinations of load cases. In accordance with the results obtained, the static strength of the attraction elements is considered to be provided in accordance with the requirements of GOST R 52170-2003 “Safety of mechanized rides. 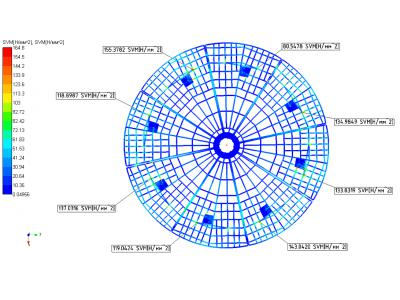 The main provisions for the design of steel structures. Updated edition. 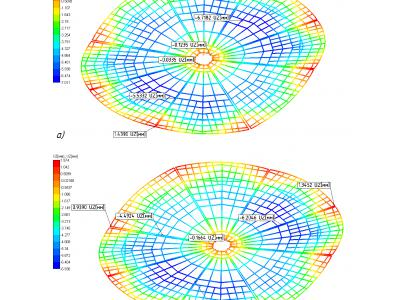 Figure 1.8 - The results of the calculation of the equivalent stresses in the platform of the amusement "Happy spinners"
Figure 1.10 - The results of the calculation of the equivalent stresses in the walls of the attraction "Happy spinners"
In accordance with the requirements of GOST R 52170-2003 “Safety of mechanized rides. The main provisions for the design of steel structures. Updated edition of the design of rides need to rely on the stability of the form. 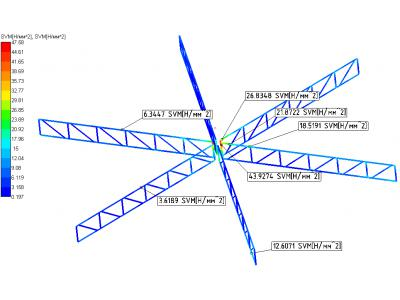 The presented calculation results in the APM Civil Engineering program show that the stability of the shape of the structures of the “Merry Pinwheels” attraction is provided with the required value of the safety factor in accordance with the regulatory documentation. 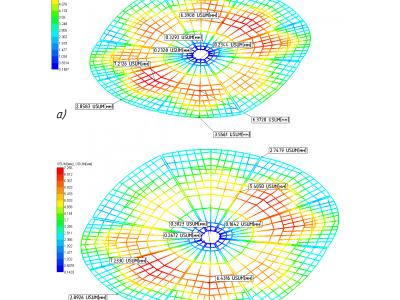 To assess the stiffness of the structure of the attraction in accordance with GOST R 52170-2003 “Safety of motorized rides. The main provisions for the design of steel structures. Updated edition ”in APM Civil Engineering calculates vertical displacements (deflections), horizontal and total displacements for the most unfavorable combinations of load cases. 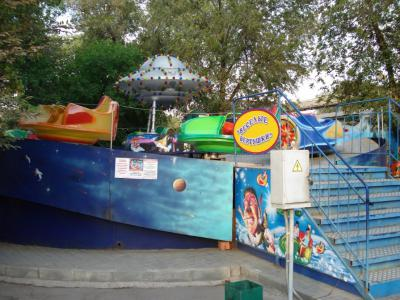 The analysis of the obtained results confirms the satisfaction of the designed structure of the attraction with the requirements of rigidity in accordance with GOST R 52170-2003 “Safety of mechanized rides. The main provisions for the design of steel structures. Updated edition. Calculation of fatigue is performed for the elements of the attraction, subject to alternating external influences that can lead to destruction. Below are the results of calculating the equivalent stresses in the elements of the platform of the attraction. 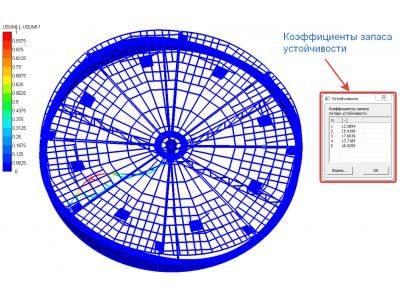 According to the results of the analysis, the fulfillment of the requirements for the calculation of fatigue, imposed on the design elements of the attraction in accordance with GOST R 52170-2003 “Safety of mechanized rides. 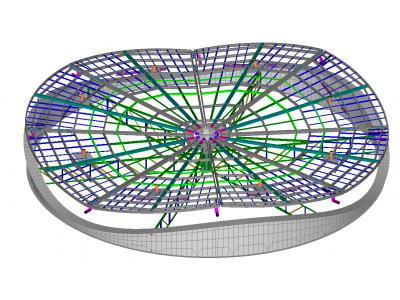 The main provisions for the design of steel structures. Updated edition. 1. 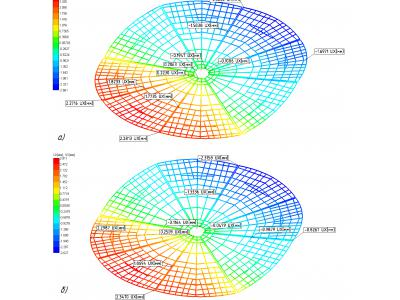 The developed finite element model, within the framework of the accepted assumptions, describes the attraction configuration, the geometric parameters and the elastic properties of the elements, the imposed external and internal geometric connections of the system, and the loading conditions. 2. The calculations were performed in full, taking into account possible adverse combinations of loads, with sufficient accuracy to obtain estimates of the strength and stiffness of the product. 3. 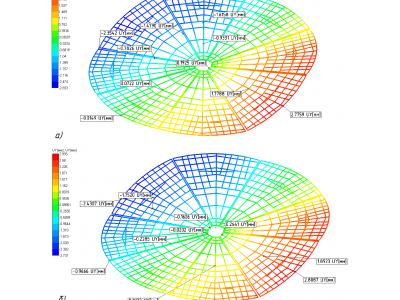 The stress state of the carrier system of an attraction is characterized by the presence of concentrations of equivalent voltages, the occurrence of which is associated with the presence in the design models of the attraction of geometric and “model” concentrators, creating in their vicinity features of the stress state. 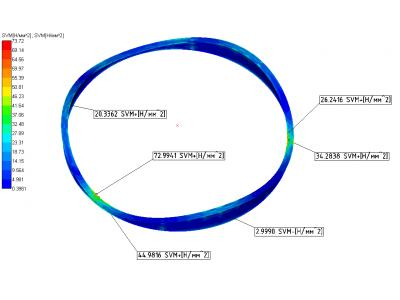 In the calculated states of the attraction, the magnitude of the equivalent stresses does not exceed the level of the design resistance of the structural material, and accordingly, the necessary strength is ensured. 4. It has been established that under the action of design loads in all cases of loading, the rigidity of the developed structural form of the attraction is ensured. The resulting movement of the elements of the attraction does not exceed the allowable. 5. When analyzing the deformed state of the system, it is determined that the shape of the product is resistant to the actual loads. 6. 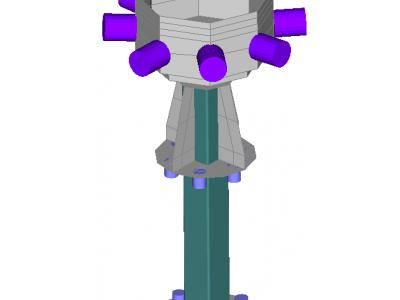 The performed calculation on the stability of the position of the attraction design has shown that the design is resistant to tipping and shifting. 7. 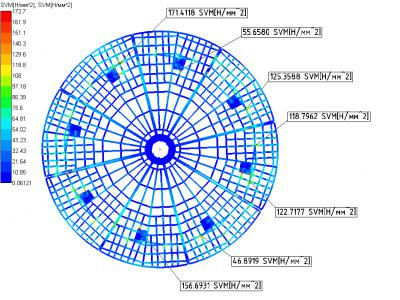 Verification of structural elements showed that all the coefficients of the health of the main elements of the attraction do not exceed the value of the unit and meet the requirements of GOST R 52170-2003 for the design of the attraction. 8. The fatigue strength of the main metalwork of the attraction is provided.